I made a double batch of these super gooey muffins by 9am today…that’s how simple they are to make! I’m going out for lunch so wanted to bake something that didn’t take long. A family friend emailed me this recipe last week and as soon as I read it I knew I had to try it – so today seemed like the perfect day. Muffins are great because they don’t need a lot (or any!) decorating. They’re not the prettiest things I have ever made but their taste sure makes up for it! Mix the wet ingredients in a jug. Pour the wet ingredients over the dry then stir just enough to combine. Place a tea spoon of mixture into to each paper case. 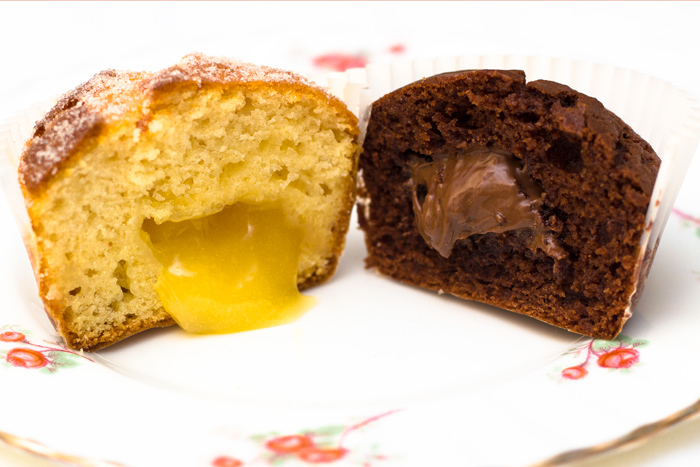 Top with 1 tspn of Lemon Curd/Nutella/anything you may wish!. Then top with remaining mixture. Bake for approx 10-15 mins until risen & firm. When cooled place 4 tbl spoons of Lemon Curd in a shallow bowl & heat in microwave until melted. Put 50g of golden caster sugar in a shallow bowl. Brush the lemon curd on to each cake then dip into the sugar. Voila! 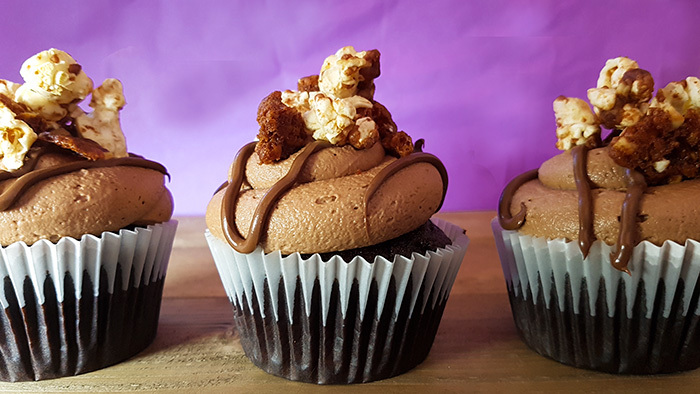 For the chocolate version If I’m feeling really naughty I top them with chocolate butter cream as well! The Nutella in the middle stays gooey & Very delic! My muffins didn’t rise quite as much as I would have liked and the lemon ones took quite a bit longer to cook. But they both taste delicious! Thanks to Donna Wood for the suggestion! « Rainbow Cupcakes Recipe – Perfect for a childrens party!